While I was unavailable all weekend, it appeared my starting XI were off to a great start on Saturday behind the foot of Sergio Aguero who fired home 3 goals against Watford. 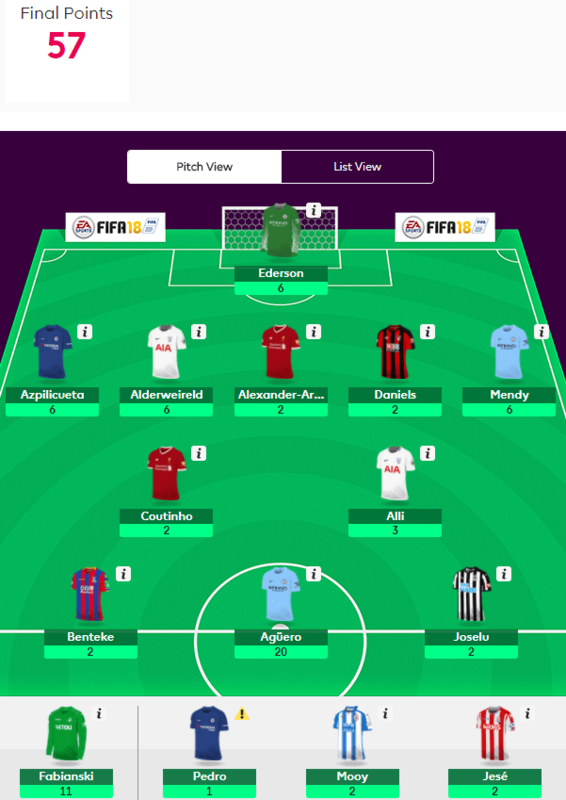 However “it got complicated” on Sunday and while I had a fair score, when compared to the other 7 teams in my league, I struggled to gain any ground on those above me. Prior to the start of GW5 I made 6 moves bringing in new talent in hopes of trying to gain an advantage to close the gap on the top three teams. Gameweek 5 wasn’t too kind, as I introduce 6 new players to my 15-man squad, 5 of which were inserted to the starting XI. The only exceptiong being Fabianski, because of his match up away to Spurs. Little did any fantasy manager know he would shutout Spurs and gain 11 points on the day! It was my hope that bringing new players in would put me in a better situation it chip away at the leaders this week. In fact, I did gain all the three managers above me in the standing, which sees me 41 points behind the top spot. On the day, nearly half my points came from Kun Aguero, scoring 20 points on his 3 goals/1 assist game. Unfortunately, his new strike partners failed to return, as I brought in Christian Benteke and Joselu. The Benteke move was more to prevent another manager from picking him up, while Joselu, like Kane had some great underlying stats. In the midfielder, Philippe Coutinho made his first start on the season, lasting 78 minutes but not returning. From what I heard, his position was a bit deeper than where we saw him last season. He partnered with Dele Alli, who gained one addition point because of the clean sheet against Swans. Jese and Mooy, on the bench were both ineffective on the weekend. Pedro left at halftime, as he picked up knock, scoring just a single points. Change could be necessary in the upcoming week. Much like my traditional FPL team I have leaned towards a #5mandefence for much of the season. This week I brought in Trent Alexander-Arnold, Charlie Daniels and Ben Mendy, all as starters. TAA was a punt against Burnley, but was left with no return as the game finished 1-1. Daniels was brought in for Yoshida (8 points in GW5) against Brighton looked promising, but the attacking defender was left with no return, leaving me in a -6 deficit. Hegazi out for Mendy in was a wash, as both finished with clean sheets (6 points). Elliot started the week between the sticks and even with a save bonus, he scored just 3 points. Overall I have scored 202 points, with 57 for the current game week. As noted I did gain points on all the managers above me, but still have some transactions forthcoming in order to strengthen my team. As of today I have put in two waiver claims. The first claim is to move TAA in favor of John Stones, doubling up on Man City defenders. Ritchie is still on the free agency list and has 4 assists in the last 3 games and and Brighton in GW6. If no other manager claims him, I will bring in and move Mooy out. Pascal Groß is currently the highest (32 points) midfielder on the free agency list.